Do you believe our attention is a finite resource? If so, consider how big and important the subject of our attention is as demonstrated just this past week by Apple, TED and the European Union. 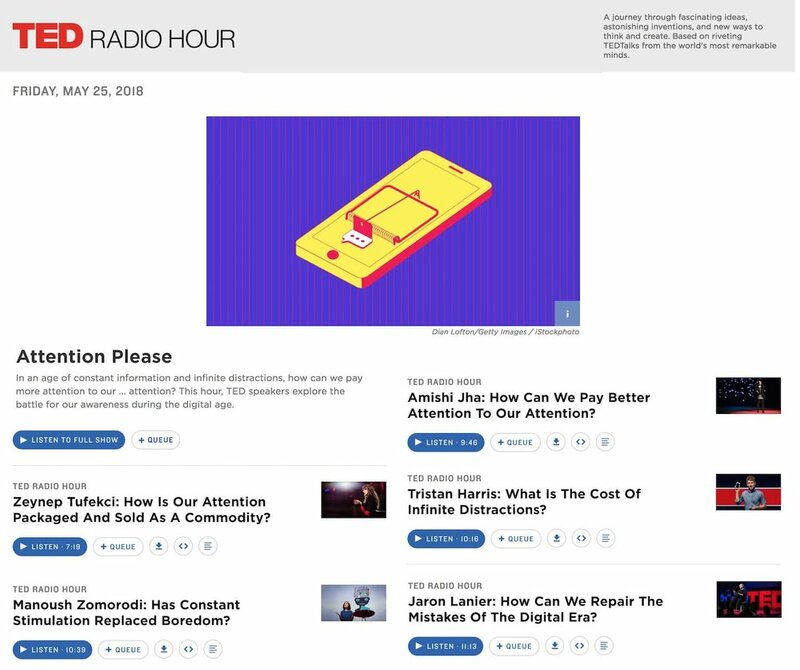 In particular, the TED Radio hour podcast last Friday, May 25th and the dire state of our attention economy. With stats like we are exposed to between 4,000 and 10,000 advertisements every day and statements like "Youtube engineers are not out to wreck the world, they’ve just set lose an algorithm”, the 49 minute podcast will give you a full picture of today's state of attention from five big minds from the TED stage. 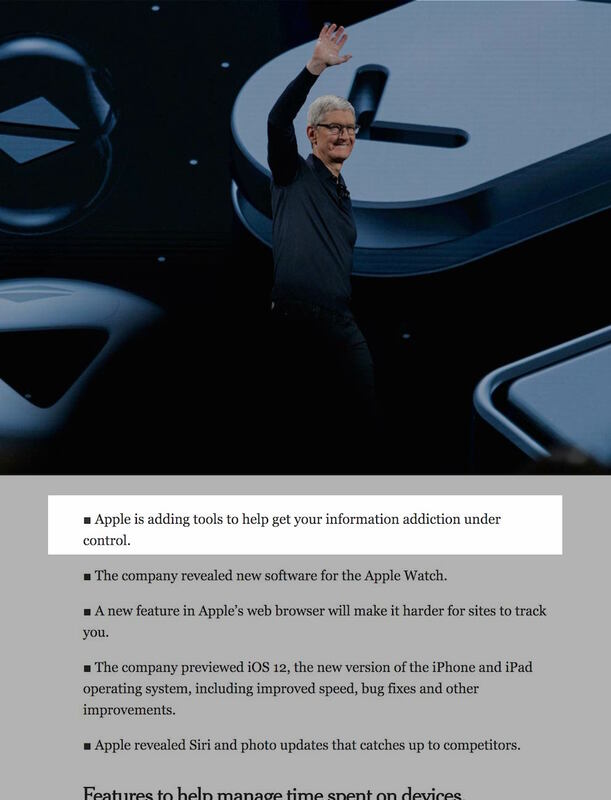 Several sources are noting a contradiction in Apple's messaging. 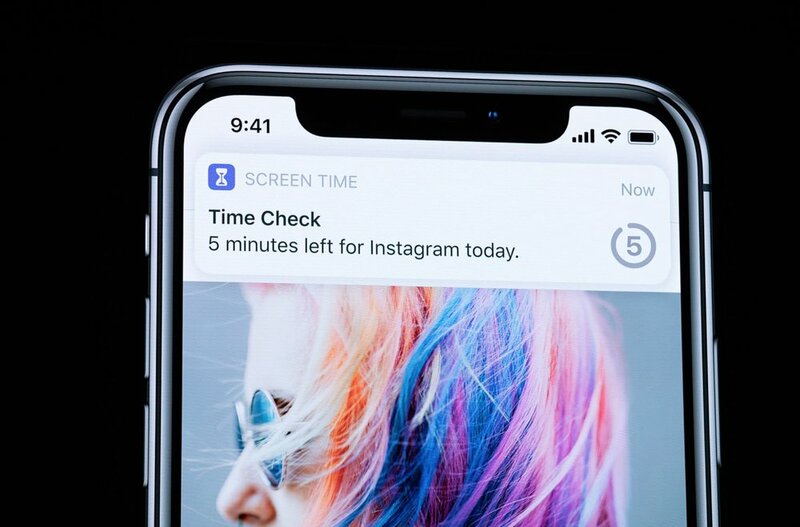 — Wired: The Addition and the Paradox of Apple's Screen Time Tools. Evolutionary theorist David Krakauer compares two technologies – the Abacus and the Calculator to illustrate how one is Complimentary: take it away and we remain better off than had we never had it, and Competitive taken away, we cannot function without it. Krakauer explains how the Abacus, still used in several countries, changes how your brain works whereas the calculator actually makes you worse at arithmetic. Other complimentary cultural artifacts: the pencil – shown to improve cognitive processing, musical instruments, and language. Contrast that to what he describes as competitive cultural artifacts like automobiles, GPS, and now it seems the Internet which rather than making us more informed is undermining our ability to find truth. Adam Alter's new book "Irresistible" tells the story of how addictive technology is decreasing our attention span. Another clue in how to asses our role in engaging an audience where our attention is holy grail. If you’re a creator or user of digital marketing, then you have an tremendous opportunity in reaping huge rewards by aligning yourself with attention best practices and nurturing people's attention. When someone – anyone is exposed to any information about you, did you give them something they can walk away with and feel improved or inspired? That’s where today’s content marketing initiatives feel more complimentary than traditional interruptive advertising more culturally competitive. Consider May 25th’s GDPR Day where the European Union regulation kicked in on digital privacy. It’s way more than updating terms and conditions. As many small businesses don’t deal with European Union citizens, they’re not worried, but actually adopting it’s principals protects you when U.S. regulations catch up and there's a lot that suggests you can actually improve engagement. The easiest example I can think of, is in the capture of someone’s email. When you use that email in an email campaign, did you specifically say “Are you cool with me sending marketing emails from time to time about this particular topic?”. Imagine if you were to treat everyone on your marketing email list like they were your best customer – or best friend even? Only sending them something they care about (segmentation) and focusing on things you truly believe can help them solve something keeping them up at night (content marketing). Pulling this off means creating uber fans which if Kevin Kelly’s 1,000 true fans theory is correct, you need far fewer engagements and budget to build a tribe of die-hard fans who will pay you handsomely. Who doesn't want to be paid handsomely? When you study SEO you learn that tricking the algorithm, while potentially effective for a time, is not the way to go. Using SEO tools to study and then mold a narrative that teaches your audience something they can use beyond you, positive search engine results actually become a side effect. The real transformation comes in understanding yourself better by being forced to articulate in your target's language who you are and why what you do is important. Theres a growing movement towards the equivalent of a digital mindfulness that's impacting the biggest organizations on the planet. This is where small businesses can jump on this immediately and gain serious advantages by investing right now in approaching digital marketing differently. Are you ready to start investing in the attention economy? At Orbis, we believe we can work with you in creating a mindful content program at a fraction of the cost that’s healthy and transformative to you and your audience. TED Radio Hour Podcast: "Attention Please"
New York Times: "Apple’s WWDC 2018 Live: Apple Still Wants to Be Different"
Wired: "Tech Addiction and The Paradox of Apple's 'Screen Time' Tools"
Philosophical Disquisitions: "Competitive Cognitive Artifacts and the Demise of Humanity: A Philosophical Analysis"